Are You Ready To Discover How To Advertise Your Business Using Google Adwords In Less Than One Hour From Right Now? After watching these super simple step by step videos...you will be advertising your website like a pro...in front of hungry customers waiting in line to buy your product or service. Making money on the internet has never been easier! So what is Google Adwords and how exactly can it help you make more money? Google Adwords is a form of advertising also known as pay per click. It works by setting up ads for your website and then listing keywords that your customers will search for. When a potential customer searches for a keyword that you used, your ad shows up in the Google search results right in front of them at precisely the moment they typed in the keyword! The tricky part is getting past the learning curve! How well you do this will determine if youre campaign is successful or if you simply waste your money and learn the hard way. Since you pay every time a visitor clicks on your ad...you can run up quite a bill if you dont have everything setup properly. All the videos in the Google PPC Basics course focuses on these six key elements and gets you past the learning curve so quick and easy that by the time your are finished watching the videos...you can have your ad up and running...making you money immediately. 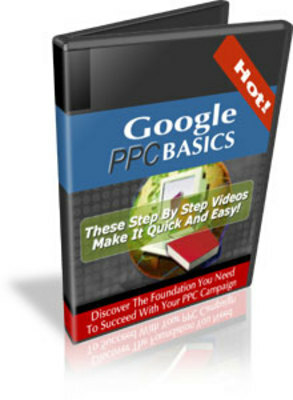 Introducing...Google PPC Basics...Your Step By Step Video Guide To Pay Per Click! Discover how quick and easy it is to effectively use pay per click advertising to make money with your website. These videos will completely eliminate your learning curve and have you advertising like a pro by the time you are finished watching the videos! Can Google Really Help My Business Make More Money? By now Im sure you have heard of Google, even if you dont know a lot about the internet. Google is a multi-billion dollar company that does nothing but direct traffic around the internet. They have the most successful and advanced system to get targeted visitors to your website. That brain child is called Google Adwords and it has changed the way people do business online. There are many businesses who spend thousands of dollars per month advertising their business with Google Adwords. They deliver what business owners and affiliates need...targeted visitors that are looking for your product! The bottom line is that Google can help your business make more money online no matter what your product or service may be. In just 57 minutes and 35 seconds you will know exactly how to advertise your business on the internet using Google Adwords pay per click! Think about it...In less than an hour you will have your website online in front of millions of people making real money. You will also be completely eliminating your learning curve! Now you can spend the next 6 months to a year focusing on other parts of your business. The great thing about these videos is you arent wasting your time with fluff and talk about things that arent related to pay per click. You get exact and precise instruction jammed packed into one tight little package. You get a break down of each section with its own video so you will never get confused or lose your way while discovering how to advertise your business on the internet. It truly is an extraordinary time saver!